How many places do you know where you can enrobe yourself in a cocoon of tranquillity and where all of the four seasons genuinely are colourful? How many places does one love more than all the moments and trips you’ve already experienced? Sites, locations, destinations, of your liking, not to be app roved by others, but just because of their sheer pureness, their simplicity and the unexpected transformative effect they have on soul and mind. It’s a question I am confronted with quite often. As stated before (<<link naar artikel>>) I indeed fell in love with Friesland ages ago, long time before The Guardian (<<link new window artikel guardian) justly shouted out all its beauty …. There must be a reason why the sheer resonance of the name evokes far away and little accessible wanderings, musings, landscapes. We do not know that many ‘truly’ deserted places where you can stroll, wander and watch birds for hours without crossing a single soul. Places where hours after your outdoor adventure, you are all sweaty and just long for refreshment, a s in a carefree skinny dip in all serenity. 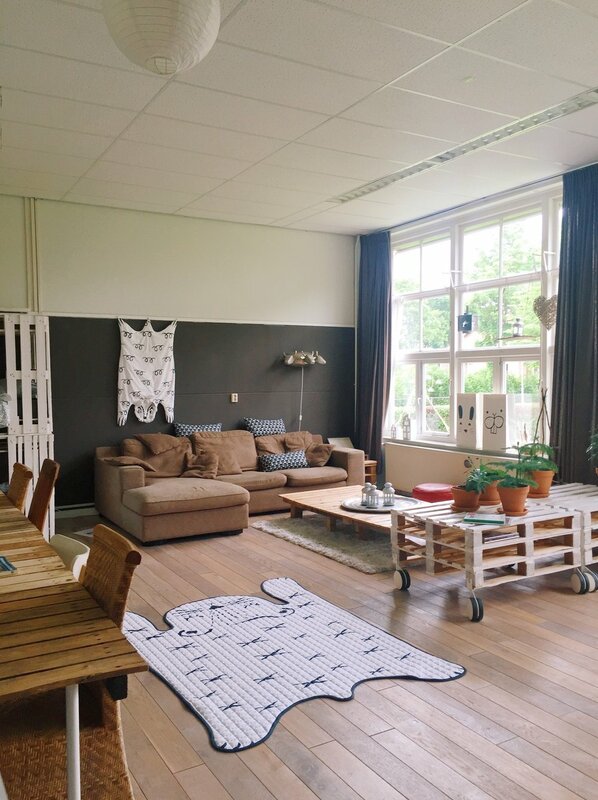 There is this magical tiny former school where you can go wild for a while, run by 2 'sunsouls' - Marieke and Roger, always on clogs, who will stay with you forever. The building’s feel is unpretentious, quirky, homely and creative: literally at the end of Friesland, a mere 100 meters from the Wadden Sea and all its splendour. Marieke and Roger opened up to the unspoilt ‘emptiness' of a fading hamlet, for all the right reasons. You enter with your private key via the pop –up shop into the endless corridor. At the left-hand side, you find an alluring classroom. The eclectic upcycled and yet very contemporary interior make you instantly feel at home: an impressive XXL table, books, plants, an old record player, hang out zones, writing cabinets, a gorgeous bed with wildflowers, …an inviting and laidback atmosphere. In the early mornings, the filtered unspoiled light dances shyly into the former classroom, perfect for some slow reading in bed just before Marieke rolls in the yummiest breakfast on a trolley – no meat products but a lot of carefully selected produces from the farms within reach. Marieke and Roger will redirect you without much ado towards incredible walks, cycling roads, farmers, … or you could just opt for a day of mudflat hiking <<link naar artikel over de wadden met hond) or an evening of culinary amazement in no-man’s land.